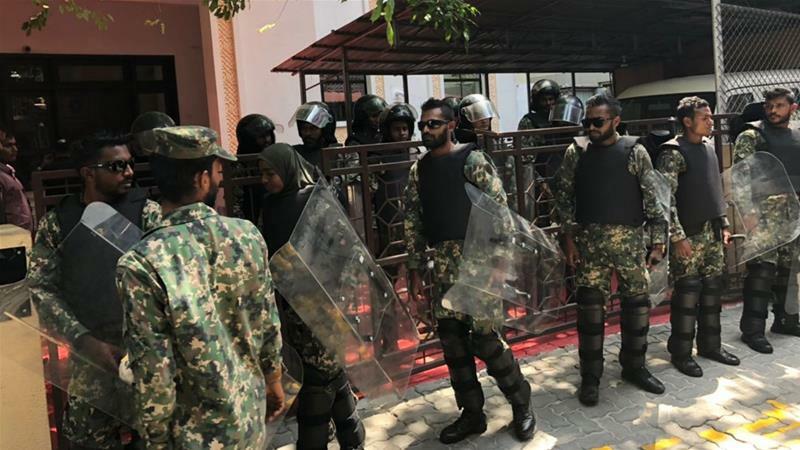 The Maldives Supreme Court has hit back at President Abdulla Yameen’s refusal to free his jailed opponents amid an escalating crisis that saw security forces seal off the country’s parliament and arrest two opposition lawmakers on Sunday. Judges of the top court said there should be “no legal barrier” to releasing the nine people, including the island nation’s exiled former president Mohamed Nasheed, whose terrorism and corruption convictions it overturned last week. Their statement came after Attorney-General Mohamed Anil raised concerns about freeing people convicted of “terrorism, bomb attacks, corruption, embezzlement, and fraud”. The top court’s ruling last week has plunged the Maldives into political turmoil and dealt a major blow to Yameen, who critics accuse of corruption, misrule and rights abuses.